I was quite surprised that very few members of staff could speak English, this didn't cause us too many problems as we only really spoke to them on arrival and departure. We only had B&B and the food was pretty good with a varied choice of hot and cold food. During our stay it was the Benidorm Festival and the hotel was overtook by hundreds of salsa dancers which left very few sunbeds and the pool became very busy. Some other guests were asked to keep the noise down (at around 1.30 am) by members of staff yet the dancers were allowed to make what noise they wanted (which went on until 6am some mornings). Would I go back there again ? probably not. 2) why is he shouting and who is that idiot to interfere with my business. 3) Is he allow to shout at other guest. 4) Did he pay for my Holliday . 5) May be am a bit dark and a stranger. Reported to the Rest Mgr( Mikhel) but he took it as a joke and instead spy on the amount of food I was having.I did inform that I am All /Incl guest here and I am allowed to eat and drink as much I can. I inform that the Spanish have to apologised with me but he didn't take any action.Moreover I did talk to the Resident Mgr(Enrique) and explain the situation .He said that will be investigated and will inform me through mail but since now no mail nothing. I will not recommend this hotel to anybody. We have visited Benidorm many times always all inclusive; this was the only hotel that the food was not good. We ate very little and it was very repetitive. The staff were lovely, and the hotel had a wow factor, it is geared up for the Spanish but it is their country. Arrived back from the gran bali on sept 3 had 1 week half board. My review is based on my experiences as reviews on other sites are hit and miss. Firstly this hotel is predominately used by Spanish holidaymakers which we didn't find a problem with but this means everything is based around the Spanish (food, entertainment) food wise there was plenty of choice and anyone who cant find anything to eat here really has problems, 3 or 4 mains to choose from, soup, salads (fresh as you will ever get salad) and dessert. Some of the food was very nice some was OK but always something you could eat. Sometimes the food was a bit lukewarm but we realised going to the restaurant as it opened solved that problem. The entertainment wasn't great as it was set up for the Spanish. The location of the hotel is great if you want a relaxing holiday with no rowdy drunken British, but if you fancy Benidorm centre then a 10 min. taxi away (9 - 11 euros) or bus ( 1.25 euros) which are the no. 41 or 12. We stayed in block 1 floor 11 room 15 which i would recommend as we had a shower cubicle, shower in the bath in a decent sized bathroom. The room was a decent size with a good sized balcony with pool view and good views of Benidorm. We found the cleanliness of the hotel satisfactory but the toilets next to the pool not very good so used toilets in reception. Got sun loungers no problem anytime of the day which i found quite refreshing (always one of the first round the pool and that was at 8.30 as the Spanish do things in their own time). There where quite a few British staying here as well so always someone to talk to. Activities during the day but nothing to get excited about. Personally 1 week was enough but got the 1 week chill out we wanted and would go back. We stayed in the Gran Bali on a Full Board basis, and considering the price we got it for, the food was acceptable, only a couple of occassions that we could not find anything at all to eat. We did choose to eat out on our last night. Rooms were an excellent size, didn't feel cramped at all, however please be aware that the balconies do not have any locks on them. The issue there is not that someone may break in but our 2 yr aold son tried to break out! And when your on the 12th floor (there are 43 floors) that's not so good. The only problem we had during our stay was the maid. Dont get me wrong the room was cleaned impedibably, but i left a bag full of dirty laundry beside our suitcase, the maid mistook this as a request to take our clothes to the laundry, we were then presented with a bill of 107 euros!!! To say was upset is an understatement. Both my husband and i went to reception and explained the clothes were not even worth that amount (4 kids vests, 3 adult t-shirts , and underware) the manager said someone had to pay and said 30 euros were acceptable. We had to pay, but this spoilt what would have been a comfortable stay. we stayed on the 32nd floor on a corner with views of benidorm the front of the hotel and la cala beach.our room had been made up o accomodate 4 beds which still left us enough room for getting about.we never made breakfast due to late nights with the kids but always found more than enough to eat either lunchtime or dinner. get in early to avoid crowds, spanish tend to eat late!and august is a national holiday for this country. we found hotel staff to be friendly and helpful. do put some money on your room card for drinks, no catch, you get back what you've not used and discounts drinks purchased.we never used the room safe this hotel does not give out any vibes of dishonesty, just hid everything in cases good security lock on door, however balconies don't lock but who is going to climb the walls?! the only disappointment was the entertainment, the girls liked some of it ,ribbon dancing etc, but had a feeling of blandness. we tended to support the local bars like ice,jolly sailor and heroes, they are almost deserted and found the bars that did not serve food had hardly any custom. please support them! ginns round the corner had an excellent menu not extensive but good quality. We stayed on the 15th floor in the smaller building. We had a pool view and balcony.Only pool views in both buildings have a balcony,rooms at the back of the 2 buildings looking inland have no balconys. If you have small children,very noisy until round midnight with the entertainment being outside by pool area in summer.Rooms clean, changed every day and stocked well with loo roll and towels. Had several british channels on the tv, mini bar in room we put are beer, water etc in fridge to chill. Safe in room round 2 Euros a day. Staff friendly, resturant - staff over keen to clear table. Food lovely, always hot, great selection - downstairs resturant better than top one as well as the salad section and hot section they have to hot grills frying something diff each nite - lamb chops, kerbabs, chicken as well as a pasta section doing pizza, pasta etc.crepe / pancakes made fresh in front of you every night too. Sun Loungers - up till round 9.30 - 10 you will get a lounger but if want a certain area up till round 9 ok. Loads pool activities in day time. Entertainment at night rubbish first night ok but its same thing every night we were there for a week. Not much buzz at night round pool area due to poor entertainment and drink prices very dear at nite. Hotel card you can put money on like a pay as you go top up card , you get 15% of drinks purchased within hotel, what you dont use you get back. Within hotel loads of buzz tourists come to see the hotel as being the tallest in europe and to travel up till the 45th floor on the outside glass elevators and to see view point. 1Euro for guests/ 5Euro non guests to visit view point. Returned back to this hotel the following year as we had such a pleasant stay the year before. We were very impressed to find that we were in the main building this time and on the 32nd floor! The views across the bay, sea and onwards where amazing and each morning you woke up to the waves. The only draw back about being so high was the time spent waiting for elevators, and even with 5 of them, we still stood there at peak times waiting like lemons. I walked it down once, and contray to belief, it was no faster! The service was again excellent and staff where much more attentative on the front desk this time. The hotel is kept extremely clean. The pool area was spotless. The food was again plentiful and catered for all tastes and nationalities. The only draw back was the entertainment as we couldn't belive the same dance troop were there again and i could remember each routine and song order from the year before. Thankfully being on the 32nd floor meant that you couldn't really hear it once you went up to your room. I have never been a fan of returning to the same hotel and have always had a slighty poor opinion of Benidorn thanks to its British reputaion but i will now return here many times in the future as it really is one of the best resorts and hotels i have stayed in across the med in a long time. Just arrived back from from Gran Bali,couldn't fault the holiday at all,we had a fantastic time. We was in the main building with a view of the pool and the beach. Hotel very clean,rooms are a little tired but very clean.Food was excellent,lots of choice,all buffet style so you can help yourself to as much as you like! Only downfall was the hotel entertainment all spanish,but there was a nice english bar around the corner with cheap drinks,so went there every night,as the bar in the hotel was quite expensive. If you want lots of nightlife you are better off staying in Lavante,but there is an excellent bus service running outside the hotel,go anywhere for 1 euro 20. We found the location of the hotel to be spot on for us as a family,felt very safe,not far to the beach. 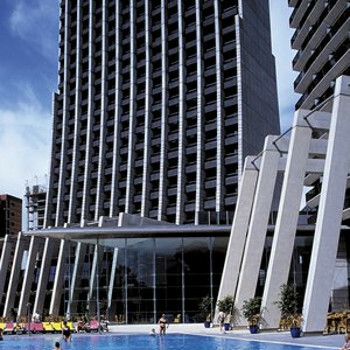 I would deffinately return to this hotel,as i wouldn't like to be based in Benidorm centre with my family. The hotel is very clean, service is brilliant staff were very helpful. the hotel food was excellent with always something to please everyone. The loctaion was quite good if you needed to travel to old town there was a bus stop about 50 meters from the hotel that took you directly to old town for a cost of 1 Euro. The Buses run until about 12 o clock. The cost of a taxi was 8 Euro.One of my friends who visited with us to Grand Hotel Bali was disabled and a wheelchair user the imenities for wheelchair users was absolutely brilliant there were lots geared towards them. I would recommend this hotel to anyone able bodied or disabled. as a able body person i will be returning to this wonderful hotel.